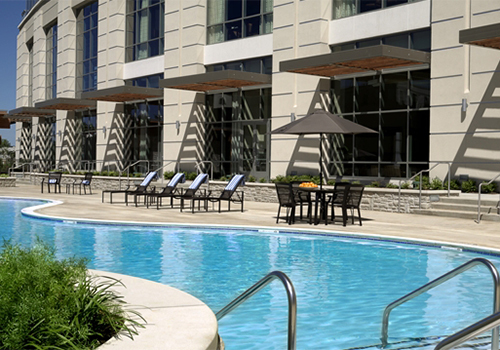 Enjoy your stay in this 12-story tower inspired by the Ozark Mountain region! 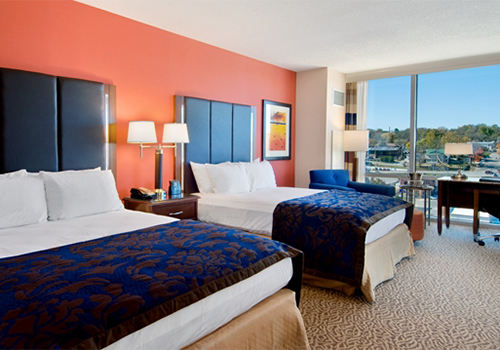 The AAA 4-diamond hotel offers lavish, comfortable, and spacious rooms, suites, and condos to guests. 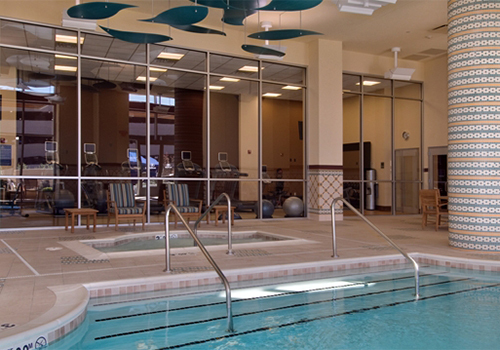 Amenities include fitness center, high-speed WiFi, LCD HDTVs, an outdoor pool with private cabanas, Level 2 Steakhouse, a signature breakfast (fee), and a cocktail lounge. 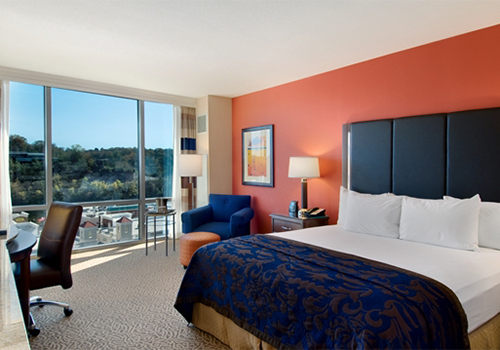 Located in the heart of historic downtown Branson, the sleek 12-story tower of the Hilton Branson Convention Center hotel offers an ideal base to discover Branson attractions or conduct business. 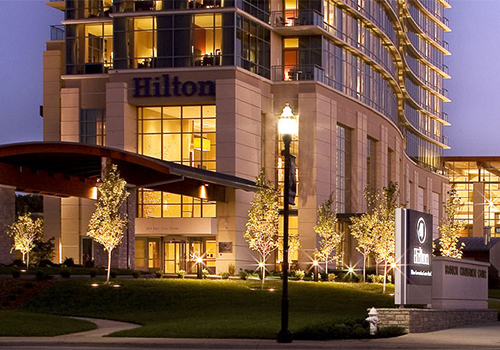 The AAA Four Diamond Branson hotel is attached to the Hilton managed Branson Convention Center and across the street from the vibrant waterfront entertainment district, Branson Landing. 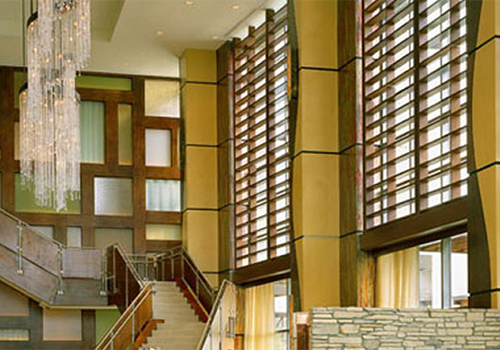 This stylish tower hotel offers a stunning design, inspired by the beauty of the Ozark Mountain Region. 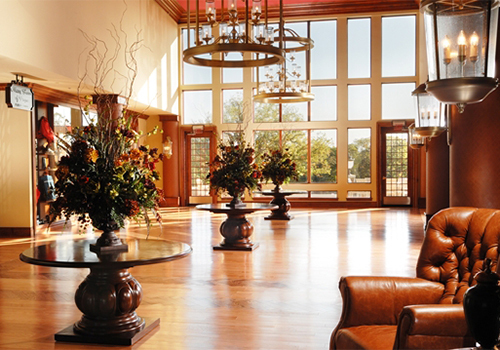 Enjoy modern, yet rustic decor and stunning views of Lake Taneycomo or the Ozark Mountains from the comfort of this Branson, Missouri hotel’s sophisticated guest accommodations. 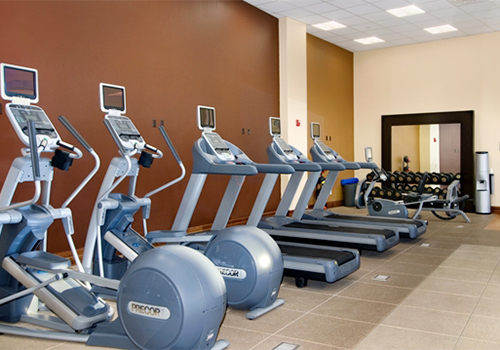 Re-energize with a vigorous workout in the hotel’s fitness center or relax in your private cabana by the pool. Indulge in a delicious steak dinner at Level 2 Steakhouse or begin the day with the Hilton Branson Convention Center hotel’s signature breakfast (Fee). 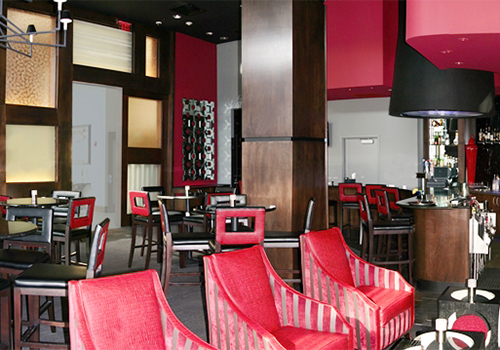 Enjoy a delicious cocktail or light snack at Clear, the hotel’s lively cocktail lounge or simply retire to a stylish and contemporary guest room, suite or condo with room service, LCD HDTVs and high-speed WiFi internet access. Connected to Branson Convention Center and adjacent to Branson Landing, with shopping and dining. Minutes from over 50 live shows and steps away from all of Branson's best attractions. Parking fee: Self-parking: $13, Valet: $22 with in/out privileges. Yes. Pets are allowed for a $50 non-refundable deposit. Pets must not exceed the maximum weight of 75 lbs. Please note your need for a pet-friendly room when booking in the “Have Special Needs?” field. Breakfast is available for an additional fee at the hotel’s restaurant. Yes. 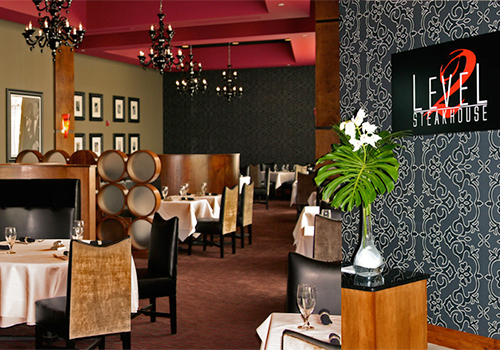 The hotel has two restaurants as well as in-room dining. Yes, the hotel has an indoor and outdoor pool. Are rollaway beds and cribs available?